Halibut straddles that fine line between firm-fleshed fish like tuna and swordfish steak, and flaky fish like cod or hake. When raw, it is fleshy and firm, but as it cooks, it separates into large, meaty flakes that require a bit of finesse if you want to avoid toughening it or drying it out. 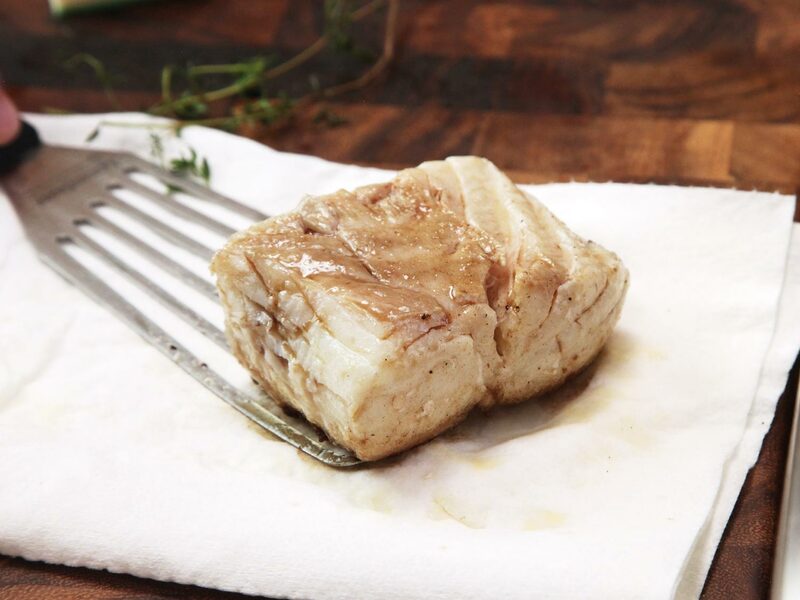 Like other flaky white fish, halibut meat is composed of layers of firm flesh separated by connective tissue. This connective tissue breaks down as the fish cooks, allowing the firmer muscle layers to separate and flake. 120°F / 49°C: Just starting to flake, tender, sashimi-like layers. 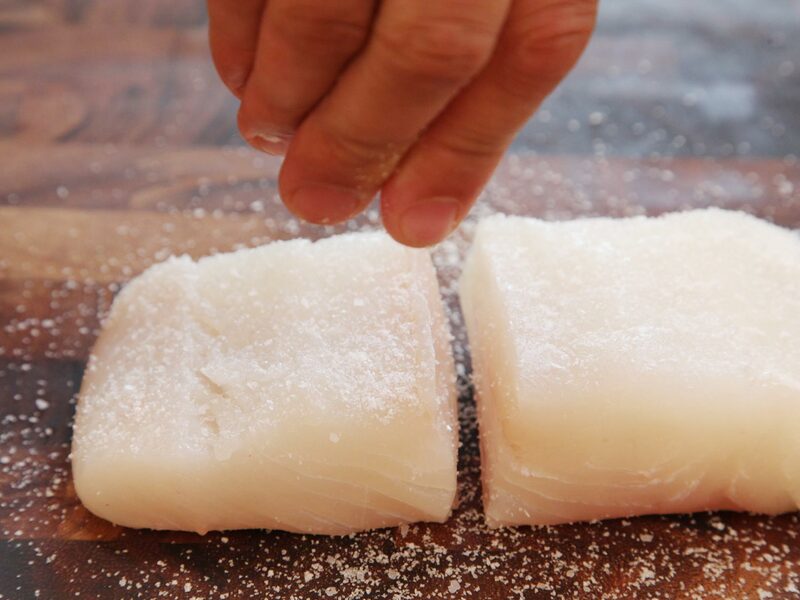 For timing, there's no need to leave halibut in a water bath for longer than it takes to just cook through–a half hour to 45 minutes is plenty for one-inch filets, and 45 minutes to an hour for filets up to two inches thick. Season the halibut on all sides generously with salt and pepper. 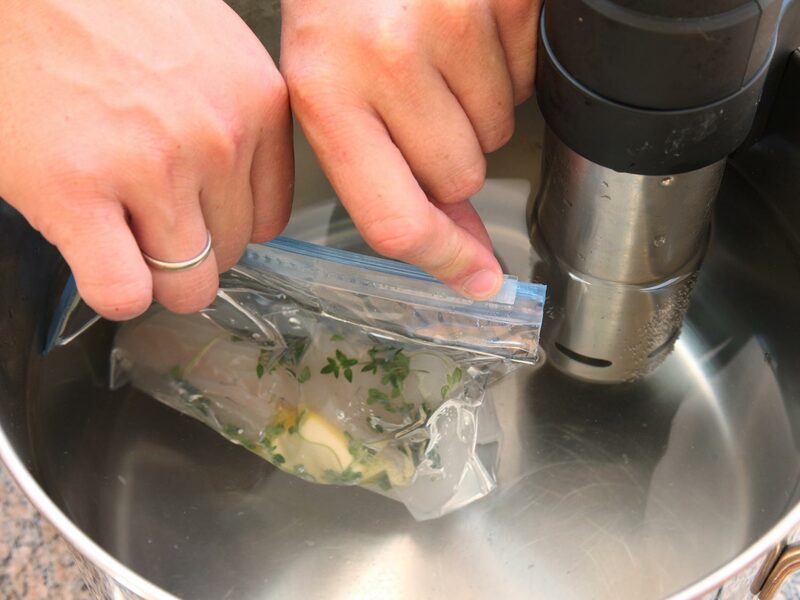 Place the halibut portions in a single layer inside one or more zipper-lock bags. Add a couple teaspoons of olive oil or butter per filet to each bag along with some gentle aromatics. Do not add large chunks of food which can damage the shape of the fish, or acidic ingredients which damage the texture. Once bagged, close the bag and let the halibut rest in the refrigerator for at least 30 minutes and up to overnight for the salt to firm up the flesh. 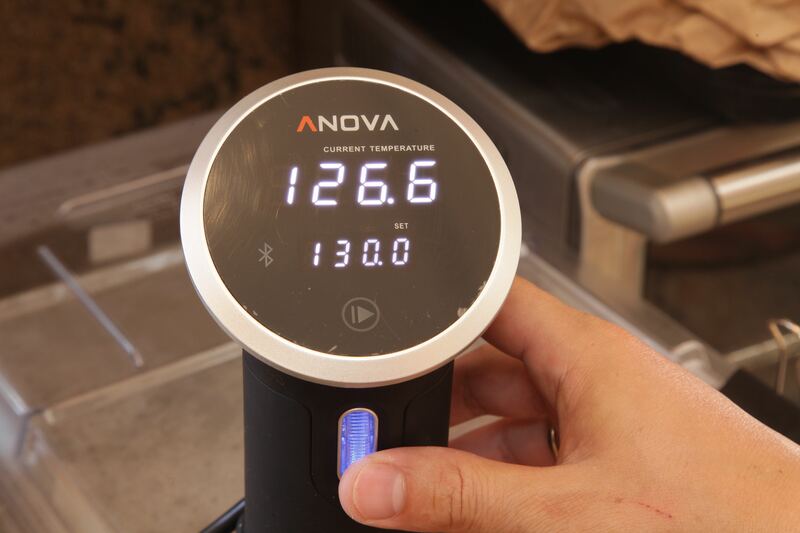 Set the temperature on your Precision Cooker according to the chart and allow it to preheat while the halibut rests. 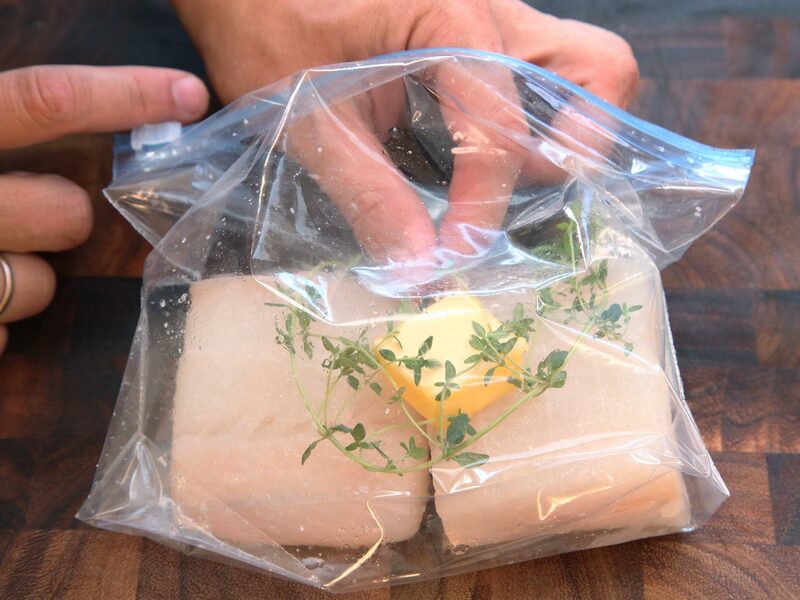 Remove all the air from the bag using the water displacement method, then add the halibut to the preheated water bath and cook for 30 to 45 minutes for one-inch filets, or 45 minutes to an hour for filets up to two inches thick. 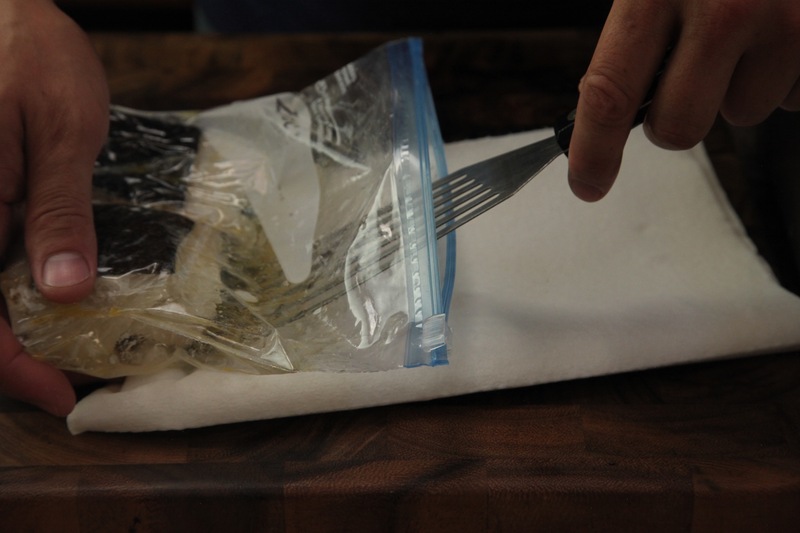 Carefully remove the halibut from the bag using your hands or a fish spatula. Place it on a double layer of paper towels, then use another paper towel to gently blot the surface dry. Discard the aromatics at this point. halibut cooked to 105°F / 41°C or 130°F / 54°C can be chilled in the refrigerator and served as-is at this point. Heat a tablespoon of butter in a heavy skillet over medium-high heat until foaming subsides. Carefully add the halibut presentation-side-down and cook without moving lightly browned, 30 to 45 seconds. Add aromatics such as thyme, garlic, and shallots, and continue to cook, tilting the pan and basting the halibut with the hot butter, until the first side is well-browned, about 1 1/2 minutes total. Flip and let second side brown for 15 to 30 seconds. 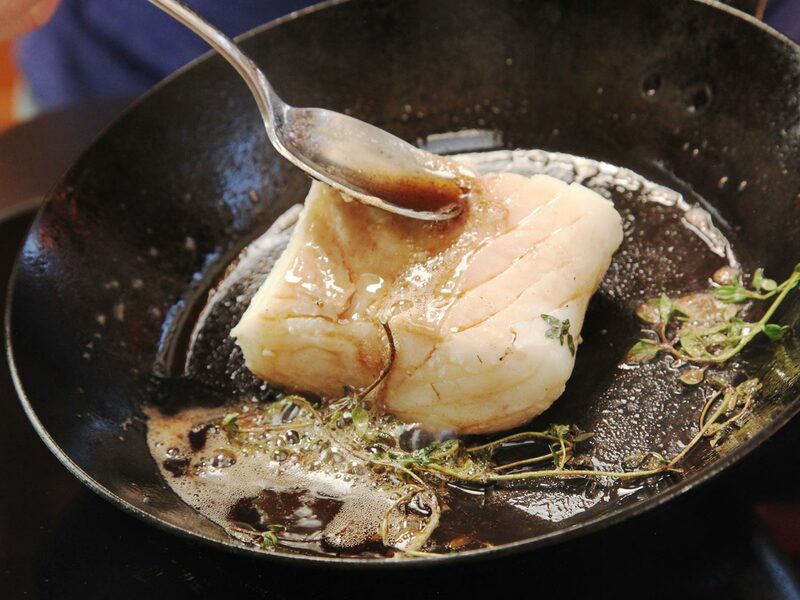 Transfer the halibut to a paper towel to blot off excess oil. Serve with a fork and a steak knife, or slice with a sharp chicken knife before serving. Make bread crumbs by combining 2 slices of bread, 1 tablespoon of butter, a teaspoon of picked fresh thyme leaves, and a clove of minced garlic in a food processor and pulse until reduced to coarse crumbs, about 10 to 12 short pulses. Spread the bread crumb mixture on a rimmed baking sheet and bake in a 400°F oven until lightly browned, about 8 minutes.